The Runaway Demigod helper of all. After the second giant war everything was normal for a bit. That's untill the gods and the campers realised that percy was becoming stronger and stronger. Zeus the paranoid jackass he is thought percy is going to overthrow him. So after a council meeting was held with both camps present. They would have him killed. Only a few stayed loyal to him. Nico, Thalia, Reyna and Artemis, Apollo, Hestia and Hades. Escaping before they could detain him he goes to the land beyond the gods. But what no one knows is he is the champion of hestia and hecate. Hestia right before he escaped. But hecate when he first became a demigod, before his quest for the master bolt. She came to him and asked him to train in the ways of the wizard and he is to tell no one, not a single dead or living soul. Since then he has trained in secret. Becoming one of the most powerful wizards without anyone knowing. On the run hecate comes to him and tell him he should go undercover at Hogwarts and she will tell Dumbledore about an anonymous ally. So thats where he's headed. Percy Jackson has just won the Giant War, but that doesn't really matter to him anymore. What's the point of saving the world if there is no one left to live in it? Everyone's gone, from both camps, and Percy is broken. He goes home, only to be greeted by a bunch of wizards who hate him. They kidnap him and force him to go to a place named after a pigs skin disease. How will Percy react when he finds out he has to save them? Will he be able to keep his true identity a secret? Will he be able to contain the raw power charging through him? Most of all, will his own nightmares destroy him before any other enemy can? Poseidon never comes to Percy's aid when he needs him. Hades finds him running and takes Percy into his care. He trains Percy with the greatest heroes in the underworld to prepare him for a destiny he will one day have to face. Percy adventures are treacherous and must achieve the impossible. Follow Percy on quests as he becomes the great hero everyone praises him for. After the giant war Percy along with Sally and Paul moves to Australia for a new start for the baby on the way. Percy IM Annabeth to tell her about the flight for her to tell him that she doesn't have the same feelings anymore and they should be friends. He gets over it pretty quickly, even though he did everything for her she dumped him and it's over now. At his new school he's known as the boy every girl wants but no girl gets. Emma, Rikki, Cleo and Bella meets the new black haired boy, but there's something strange about him. Almost like the moon pool only stronger....much stronger. Who will find out who's secret first? Will the mermaids succumb to his royal aura? What about his new tail? Disclaimer : I do not own any of the stories only the plot. Percy was betrayed and disowned by the Gods and demigods. i know what your expecting. When does Percy meet Chaos and get sent back to Earth to face his old family after like 20 years. The answer is never. Instead of meeting Chaos, Percy goes home to his mom and stepdad, Paul. Turns out Percy has a 1 month old little sister. Sally lets him stay since he was a disowned son of Poseiden, which means he is mortal, which means he has no Godly scent. How does Percy fair after Sally, Paul, and his little sister, Jenny, are murdered and some wizards come knocking on his door, telling him that his Grandpa on his moms side is an evil wizard called Voldemort and he has a lot of magic potential? He thought the weird life was over after he was disowned. Guess the Fates still hate him. a person or thing that protects someone or something. After Percy Jackson gets betryed by his family, he not only goes to start his life over in some place new, but a new planet. Now, he is back on planet 3, but not where you expect him to be. His mission is simple; Protect Harry Potter. But how will the wizards react to Percy? I know it's a sucky summary, but give it a try. Percy Jackson is betrayed by Annabeth. He leaves camp and goes to Olympus, where he gets blessed by Hecate, Hades, Hestia, Zeus, and Artemis. Hecate gave him knowledge of a wizard. Hades gave him power over shadows. Hestia gave him power over the hearth. Zeus gave him some of his domain. Artemis gave him power over the moon and the best archery there is. With his powers, he goes on a mission to Hogwarts where he finds new friends and more enemies. What will happen when he realizes he can talk to, control, and turn into snakes? Or when he gets told he's related to Voldemort? Find out!! Wattpad deleted my first description so I had to write a new one >-< Oh well! I only own the plot and new characters! PJO x HP   Percy Potter is the forgotten brother of the infamous, Harry Potter. Percy Jackson's father is a Greek god and had left when he was born, and his mother died only moments after giving labor. Lily and James Potter thought they couldn't have a child. They had tried many times before but have failed. They came across a certain sea green eyed boy in an orphanage, and adopted him. But only a month later they found out Lily was expecting. Harry was born and the two baby Potters were loved equally. Friends of Lily and James were astonished by their similar appearance and the boys were often mistaken as twins. One Halloween night, Lily and James went out to a Halloween party and left the boys with a babysitter. The Dark Lord of the wizarding realm, came to their home hoping to rid the child destined to be his downfall according to a prophecy. He killed the babysitter and went upstairs to finish the job. But he found two children in the room and decided to kill both. Both Harry and Percy were hit with the curse but the curse on Harry repelled because of the power of love from Lily and the spell did not harm Percy for he was a demigod. James and Lily returned home and found their home a mess but their boys safe. "THE DARK LORD GONE!" and "THE BOY-WHO-LIVED"
Nowhere in the papers was Percy mentioned. Percy was betrayed by his home and family (on the godly side). 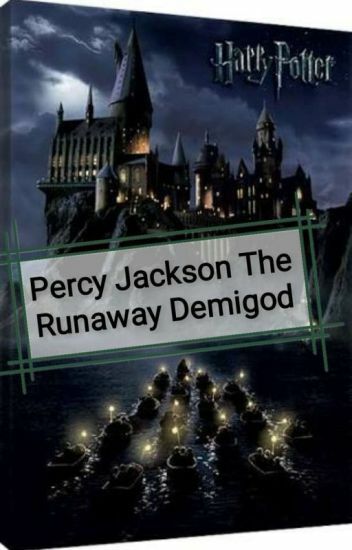 Disowned by Poseidon and forced into hiding from the gods, Percy ran away with his remaining friends only to discover the truth about himself.... Now he's back to save the world from his youngest son, End. Follow Percy along with his friends and his past wife, current girlfriend, back to the world of betrayal. Can he forgive those who betrayed him and move on??? Even though this is a Percy betrayal story, there are some stuff you need to know. 5) This is the first time I'm writing a story so it may not be perfect but please give it a shot and read it. If you like or enjoy the story please vote, comment and share. And if you have any ideas on the story or character please go ahead and comment but that doesn't necessarily mean that I will use it. After the Second Titan War, Percy Jackson and his family were ready for a break. In a moment of inspiration, Sally decided they would all mover to Australia, the one place the gods promised would be monster free. Now, Percy finds himself entangled with a misfit pod of merpeople that are convinced he's some sort of god, a cousin that magically became a mermaid with her friends, weird memories that shouldn't be there, and oh yeah. Obviously I don't own any of these character because I'm not a man. The son of the gods. Percy Jackson lived a happy normal live until monsters came and killed his foster parents. He meets his real mother and she teaches him for a year, when she too gets killed by the Minotaur. Having learned of Olympus from his mother he goes to the gods to request a job.